Carey Dean Moore, 60, a convicted murderer of two 47-year-old fathers in 1979, has become Nebraska's first execution by lethal injection. The execution by lethal injection — by way of a four-drug combination that's never been previously used in an execution — started at 10 a.m. Tuesday, as scheduled. He was declared dead at 10:47 a.m. Tuesday. "This agency has done so with professionalism, respect for the process, and dignity for all involved," said Department of Corrections Director Scott Frakes in a press conference following the execution. The body will be remanded into the custody of the Nebraska State Patrol, he said, and an autopsy will be conducted. Ten witnesses observed Tuesday's execution: three inmate witnesses, a member of the clergy, four media witnesses, and two staff members. 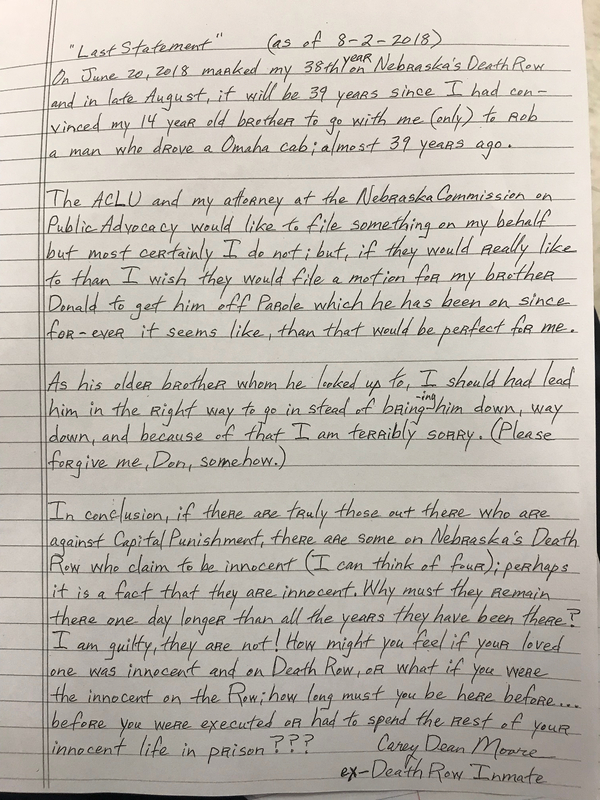 "Just the statement that I hand-delivered to you already about my brother, Donny, and the innocent men on Nebraska's Death Row." Omaha World-Herald reporter Joe Duggan , another of the media witnesses, said Moore remained composed throughout the process. "He certainly looked maybe slightly shaken. The gravity of what was happening to him was clear on his face and his expression," Duggan said. "But he was composed. His voice was clear when spoke. He clearly looked around the room to see who all was there, otherwise kind of kept his gaze toward the floor." The media witnesses said they were not able to see when each drug was administered during the lethal injection procedure. They said they were secluded from the other witnesses, and could not hear inside the execution chamber. "There didn't appear to be any complications," said News Channel Nebraska reporter Chip Matthews, another media member selected to witness the execution. Brent Martin of Nebraska Radio Network was also a media witness to Moore's execution Tuesday. Martin, who has witnessed several other lethal-injection executions, said Moore's execution took "much longer." Duggan said it was recommended to the witnesses and those who assisted in preparing for an execution that they seek out someone they can talk to as they process what they have witnessed. Moore was sentenced to death for the 1979 shooting deaths of cabdrivers Reuel Van Ness and Maynard Helgeland in Omaha. Both men were 47-year-old fathers shot by Moore five days apart. Ahead of the execution, Moore was taken from his death-row cell at Tecumseh prison to the State Penitentiary in Lincoln and placed under a suicide watch in a medical unit there until his execution. As the execution proceeded, the prison went on modified operation status: Inmates were required to stay in assigned living spaces until the execution was over and all media and witnesses had left. Moore was escorted to the execution chamber and strapped to the table, at which point IV lines were inserted by the IV team, and a heart monitor secured. Witnesses were then escorted to their respective viewing rooms. A curtain was lifted so that witnesses could observe Moore had been prepped for lethal injection, then Frakes gave the order for execution to proceed. The warden checked for consciousness after the first round of drugs was administered before ordering subsequent substances administered. Once all four drugs had been administered, the curtain was lowered. The Lancaster County Coroner officially declared the death, out of sight of the media witnesses. Once Moore's death was confirmed, the curtain was lifted so media could view the body. Frakes and media witnesses are expected to address the media following the execution. A few family members of Moore's victims and a handful of death-penalty protestors gathered Monday morning outside the state penitentiary in Lincoln. Moore's execution has been fought in the courts by drug companies Fresenius Kabi and Sandoz Inc. , which each filed a lawsuit saying use of their drugs in the lethal-injection execution would harm their reputation. But the state would not confirm where the drugs were purchased. The state has carried out 37 executions; the last execution in the state's history was carried out by electric chair. Harold "Willi" Otey was executed in 1994. John Joubert was executed in 1996. Robert Williams was executed in 1997. Sisters of Mercy in Omaha also made a last-ditch effort Monday night to convince Gov. Pete Ricketts to halt the execution , traveling to Lincoln to hand-deliver a letter.